Tony taught Spanish at Saint Mary’s University for 36 years. He is originally from the San Francisco Bay Area of California. He completed his undergrad and Master’s at the University of California, Berkeley, which included a year at the University of Madrid, and then went to Princeton, New Jersey, to earn a PhD. In the early ‘70s, Tony applied to Saint Mary’s for a teaching position, thinking he would be in Halifax for a short while before moving on. As life turned out, he has lived here ever since. Beverly is French Acadian, originally from Pubnico. She came to Halifax to study Arts at Mount Saint Vincent University, and then completed a Master’s in Social Work at Dalhousie, and has worked in Child Welfare throughout her career. It was a mutual acquaintance that eventually brought Beverly and Tony together. Carole Hartzman was Beverly’s professor of Spanish at the Mount. She introduced the pair back in 1980, and has remained a close friend ever since. Tony and Beverly were married in 1983, and the rest is history. They are now enjoying an active retirement, travelling in Europe and taking in much of what the arts scene in Halifax has to offer. 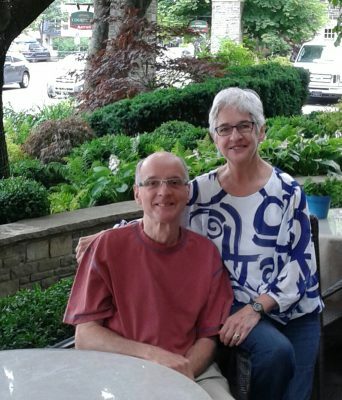 Tony and Beverly share a deep love of music, and have been loyal and very enthusiastic supporters of Symphony Nova Scotia for many years. In May 2016, they notified the office about a gift in their will, and shortly thereafter, they were among the first members of the Legacy Circle. Recently, they shared their thoughts about it.